Laura D. Phillips has represented injured people in medical malpractice, personal injury, workers' compensation, and products liability cases in all levels of state and federal courts in Pennsylvania for over a decade. Her casework has included cases involving wrongful death, birth injuries, surgical errors, delayed diagnosis, motor vehicle collisions, trip and fall cases, misdiagnosis, liquor liability, product warning, and product safety cases through all stages of trial and appeals. Laura is proud to hold an "AV Preeminent" Peer Review Rating from Martindale-Hubbell, the highest possible rating by her fellow attorneys for both legal ability and ethics. Due to her trial advocacy skills, Laura has also been recognized as a member of both the Academy of Trial Lawyers of Allegheny County and Academy of Trial Lawyers of Southwestern Pennsylvania. Since 2015, Laura has been recognized as a Pennsylvania Super Lawyer in the field of plaintiff's medical malpractice litigation since 2015, and was previously named several times as a Super Lawyers Rising Star in the field of plaintiff's personal injury litigation. Super Lawyers is a rating service of outstanding lawyers from more than 70 practice areas who have attained a high-degree of peer recognition and professional achievement. Super Lawyers Rising Stars are considered the top up-and-coming attorneys in their field who have been practicing for fewer than ten years. She is also a member of the Million Dollar Advocates Forum, whose membership is limited to attorneys who have achieved verdicts and settlements on behalf of their clients in excess of one million dollars. 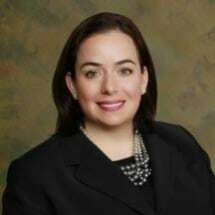 Laura has served on the Board of Governors of the Western Pennsylvania Trial Lawyers Association since 2007, and she also served on the Board of Governors of the Pennsylvania Association for Justice (PAJ) between 2008 and 2017. She is a former Chair of the Future Leaders Section of the PAJ. She is a former President and Vice-President of the Young Lawyers' Division of the Washington County Bar Association, and was a member of the bar association's Executive Committee. Laura is also a member of the Women's Bar Association of Southwestern Pennsylvania, American Bar Association, American Association for Justice, and Allegheny County Bar Association. Laura earned her Bachelor of Science from Georgetown University in 2001, where she was a member of the International Politics Honors Program. She received her JD from Georgetown University Law Center in 2004, where she was a Legal Research and Writing Fellow. While in law school, Laura was selected to be a member of the Appellate Litigation Clinic and represented clients in the United States Court of Appeals for the Fourth and D.C. Circuits. After graduation, Laura worked as a litigator in Washington, DC before returning to southwestern Pennsylvania. She was raised in Washington, Pennsylvania and attended high school at Mount de Chantal Visitation Academy in Wheeling, West Virginia. Laura is frequently invited to teach continuing legal education (CLE) courses, and she has spoken on topics including trial tactics, professional ethics, courtroom technology, and proving damages. Laura resides in the Lawrenceville neighborhood of Pittsburgh with her husband, Bryan Mills.